This modern translation of the Abhidhammattha Sangaha (Manual of Abhidhamma) offers an introduction to Buddhism's fundamental philosophical psychology. Originally written in the 11th or 12th century, the Sangaha has served as the key to wisdom held in the Abhidhamma. Concisely surveyed are Abhidhamma's central themes, including states of consciousness and mental factors, the functions and processes of the mind, the material world, dependent arising, and the methods and stages of meditation. This work presents an exact translation of the Sangaha alongside the original Pali text. 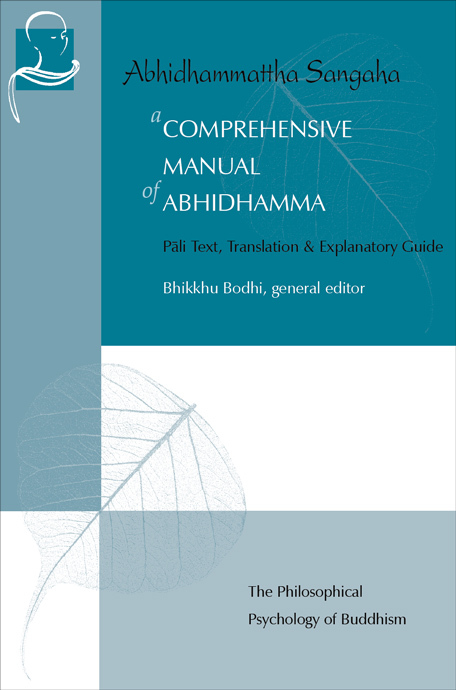 A detailed, section-by-section explanatory guide and more than 40 charts and tables lead modern readers through the complexities of Adhidhamma. A detailed introduction explains the basic principles of this highly revered ancient philosophical psychology. The Abhidhamma, the third division of the Tipitaka, is a huge collection of systematically arranged, tabulated and classified doctrines of the Buddha, representing the quintessence of his Teaching. Abhidhamma, meaning Higher or Special Teaching, is unique in its abstruseness, analytical approach, immensity of scope and conduciveness to one's liberation. In the Abhidhamma, the Buddha treats the dhamma entirely in terms of ultimate reality (paramattha sacca), analyzing every phenomenon into its ultimate constituents. All relative concepts such as person, mountain, etc. are reduced to their ultimate elements which are then precisely defined, classified and systematically arranged. In Abhidhamma, everything is expressed in terms of khandha, five aggregates of existence; ayatana, five sensory organs and mind, and their respective sense objects; dhatu, elements; indriya, faculties; sacca, fundamental truths; and so on. Relative conceptual objects such as man, woman, etc. are resolved into ultimate components and viewed as an impersonal psycho-physical phenomenon, which is conditioned by various factors and is impermanent (anicca), suffering (dukkha) and without a permanent entity (anatta). Having resolved all phenomena into ultimate components analytically it aims at synthesis by defining inter-relations (paccaya) between the various constituent factors. This volume, a recent update of Ven. Mahathera Narada's classic annotated translation, contains the Pali text, Bhikkhu Bodhi's lucid, revised translation, and a long introduction by Bhikkhu Bodhi and Ven. U Rewata Dhamma explaining the basic principles of the . It also features 48 charts and tables representing the subject in a visual format, provided by Ven. U Silananada. See also the PTS Pali edition of the Abhidhammattha Sangaha and the PTS translation Compendium of Philosophy as well as Process of Consciousness and Matter, by Ven. Rewata Dhamma, available as an ebook.